Posted June 11, 2018 at 3:00 pm . 0 comments. 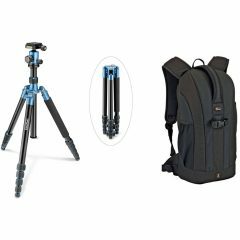 B&H Photo Video has the Prima Photo Prima Photo Big Travel Tripod (Blue) and Lowepro Flipside 200 Backpack (Black) Kit for $79.95. This kit regularly goes for $149.95. The Big Travel Tripod from Prima Photo offers a strong camera support in a lightweight and compact build. The tripod features a maximum height of 53.9″, a minimum height of 16.5″, holds up to 17.6 lb and weighs only 3.6 lb. The Lowepro Flipside 200 Backpack (Black) is a tough, 600 denier water-resistant polyester backpack that protects digital photo equipment against moisture and abrasion. It is carried by a backpack harness with a detachable waist belt. There is an adjustable sternum strap for comfort.